Endive is a great alternative to crackers or thin slices of baguette for serving heartier appetisers like a chicken salad or a more potent cheese: Its leaves give the needed crunch for fewer calories. 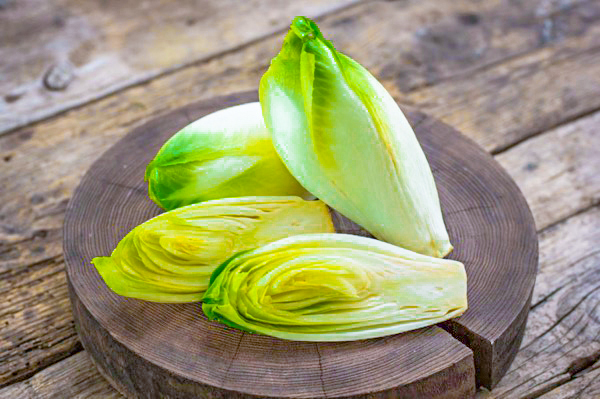 When shopping for endive or any kind of chicory, look for a tightly closed, white, crisp leaves that turn light yellow or yellow at the ends when picking endives to buy at the store. Brown edges, red-brown spots or discolouration? These are all a no-go. Endive, when stored in an airtight bag, lasts about a week in the fridge and contains the probiotic fibre inulin, which has a positive effect on blood-sugar levels. It also contains the bitter compound lactucopicrin, which helps to promote digestion. Lots of crunch, few calories: Endive is essentially a healthy cracker 0 out of 5 based on 0 ratings. 0 user reviews.